Since 2005, I’ve personally helped 100+ businesses migrate to Salesforce. Along the way I’ve learned that small and medium businesses face some unique challenges. In no particular order, here are my top five challenges facing SMBs (Small and Medium Businesses) when implementing a CRM. Small business owners and their team wear multiple hats. They do not have a dedicated IT or Project Management resource. For the person anointed with the job of running the CRM project, the initiative tends to play second fiddle to their "day job." Though they always want to accelerate an implementation, faced with the day-to-day challenges of running the business, they rarely can dedicate the time to meet more than once a week. From our experience, a single weekly meeting of two hours is optimal for an efficient and productive meeting. Founders can be a challenge for two reasons. Some are so overbearing that their employees are too intimidated to speak up in requirement gathering meetings, resulting in valuable insights being omitted. Even worse the founder mandates that they be the sole source of information on how the CRM should be designed – "I’ve done every job at this company!" The danger here is that the founder may be too far removed from the front line. If the CRM doesn’t add value and efficiency for end users, adoption will suffer. Ensure you have good representation at your discovery meetings and an open dialogue. Probably the most underestimated task when moving into a CRM is taking all the repositories where your customer data resides today (accounting systems, marketing email lists, MS Outlook, Access databases, etc) and getting it collapsed down into one file so it can be scrubbed for duplicate records prior to being imported into your CRM. This is an extremely tedious but necessary step in the process. User adoption will plummet if (1) their business contacts are not in the CRM the day you go-live, and (2) they get frustrated sifting through duplicate records. If you’re an SMB and you have a clean customer database – congratulations, you’re at the head of the class! In a perfect world a CRM should support and enhance how a business markets, sells and supports their customers. The reality is that many companies in the SMB space don’t have good processes in place to start with and are looking for consultants to share the wealth of what they’ve learned working with other organizations. We have no problem facilitating these discussions and providing best practices, but my advice here is to hammer some of this out in separate meetings amongst your internal team. You don’t have to have perfection before moving into a CRM, but you do want to start thinking about the steps you take to qualify, sell and support your customers. 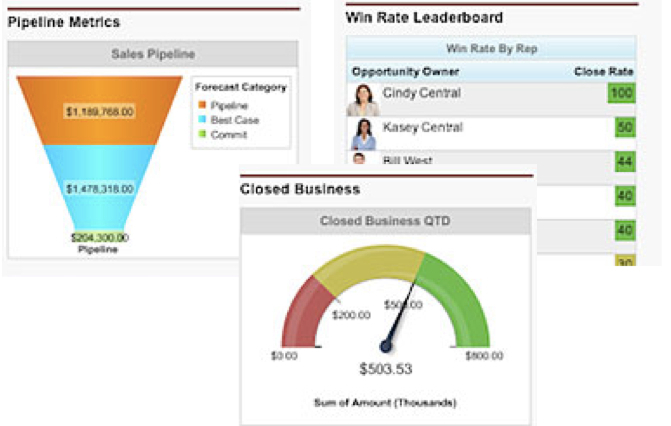 The final challenge SMBs face when migrating into a CRM is knowing what you want to measure before you start (i.e. have the end in mind). If you peel back the fancy user interface, a CRM is just a database. If there are certain KPIs (Key Performance Indicators) and metrics that are important for your business to track, you need to ensure you’ve configured the CRM to capture that data up front. If you have reports that you’re using today to manage and measure your business, provide examples to your consulting partner. If your in the SMB space and are considering Salesforce.com as your CRM, we’d love to help. You can contact us here.